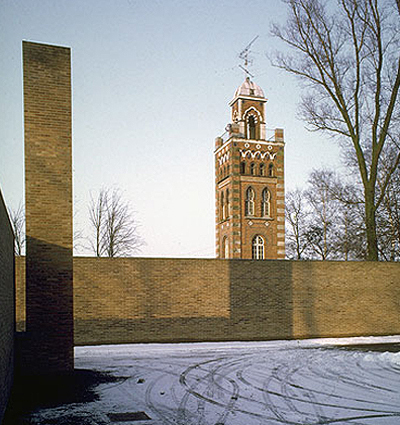 Today, we pay tribute to the work of the Belgian architect Lou Jansen. 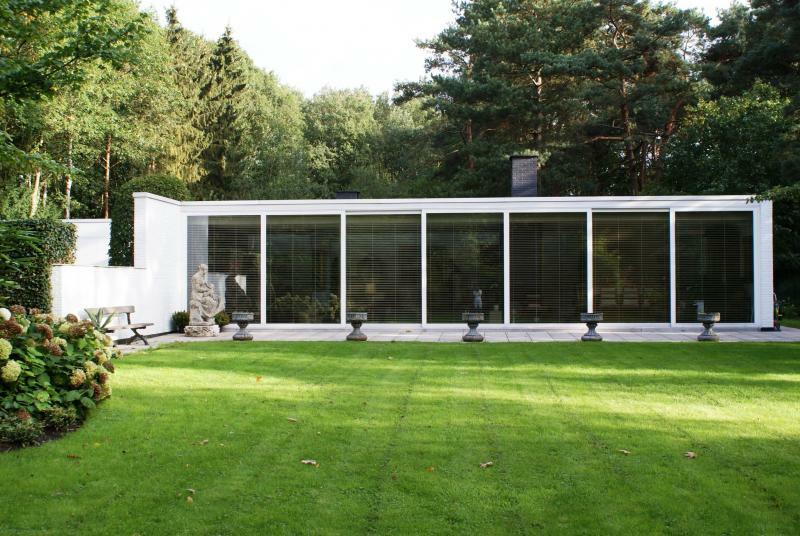 While almost completely unknown to the rest of the world, the area around Turnhout, a leafy suburb of Antwerp Belgium, is dotted with beautiful mid century modern minimalist houses. These hidden treasures are often hard to find since they weren't always documented or published in the manner of their counterparts in the US (Richard Neutra's work for example). So looking for them often feels like a treasure hunt. Many of these icons of mid century modern minimalist architecture were designed by the notable Belgian modern architect Lou Jansen. 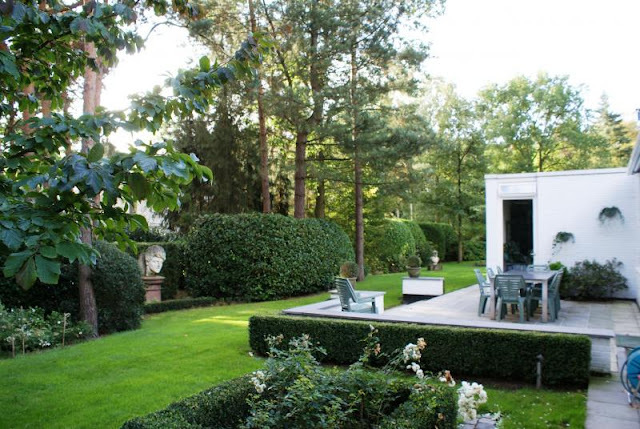 His houses are often framed against a wonderful green backdrop which provides the perfect balance between the restraint minimalist architectural style of Lou Jansen and the naturally perfect greenery of the leafy Antwerp suburbs. 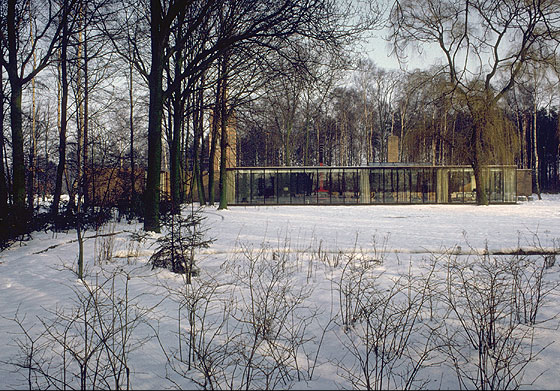 Lou Jansen can be considered to be one of the most prominent figures of the Belgian modernist architecture movement. 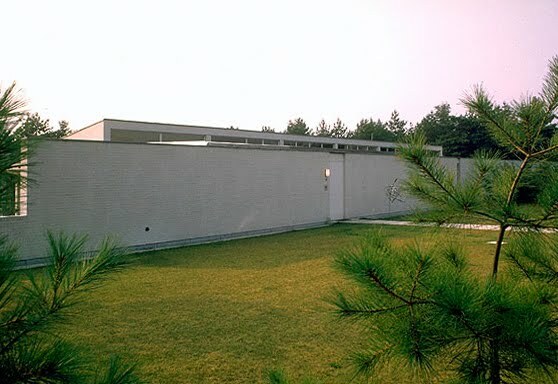 He was an early adopter of the rationally designed, minimalist modern architecture movement. 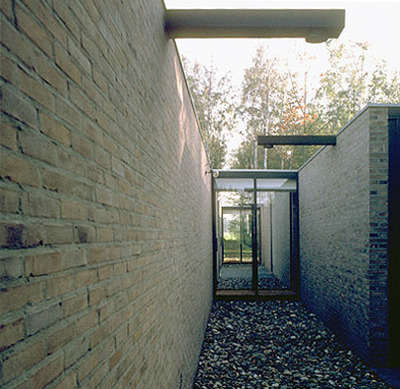 The style of Lou Jansen clearly displays a true understanding of the "less is more" philosophy in the manner of his German predecessor Ludwig Mies van der Rohe. Through his work, Lou Jansen defined the image of modern architecture in Belgium and framed his beautiful minimalist architecture of the time for a small but grateful audience of his followers. 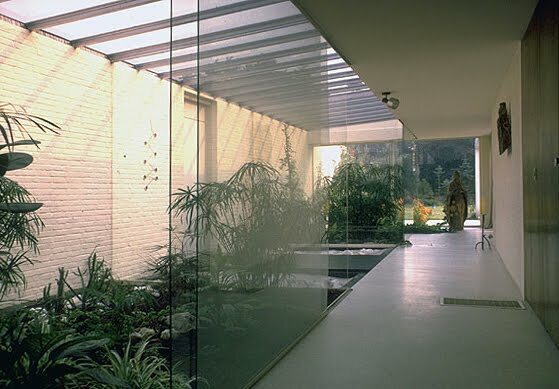 Too bad that Julius Shulman wasn't there throughout his career to photograph the architecture of Lou Jansen since he would have surely fallen in love with it. 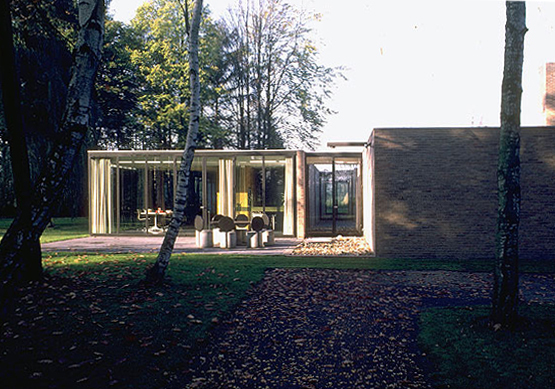 Pictured above are some of Lou Jansen's most notable icons of modern architecture include his "Woning Mil Jansen" built by Lou Jansen for his brother in Merksplas Belgium in 1962 and "Woning Proost" built in Schilden in 1965 (the last one; unfortunately now demolished). The "Woning Mil Jansen" is especially remarkable since it is a perfect masterpiece, a work of art, a composition done right down to the last detail. This light and airy house displays a distinct peacefulness with its gracious minimalist lines and sense of balance and structure. Created six years before Stanley Kubrick released his epic '2001: A Space Odyssey', the house displays a similar monolithic tower, its shadow once-a-day perfectly aligned with the age-old tower located outside the perimeter. The artful combination of the architecture and shadow creates a unique display throughout the day. Icons like these certainly deserve the same attention that has been given to other mid century modernist architects like Le Corbusier and Marcel Breuer. 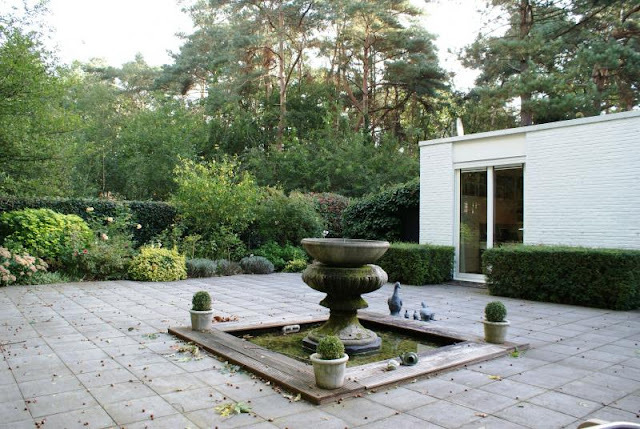 'Rodedreef Huis' courtyard would look nice with Bertoia Chairs or Richard Schultz Chairs. 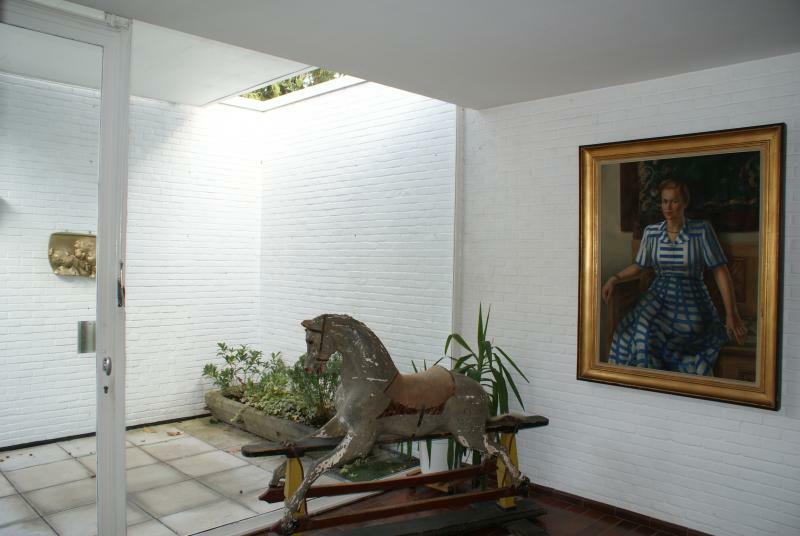 'Rodedreef Huis' fountain should be replaced with a water fountain sculpture by late Belgian modernist artist Pol Bury.